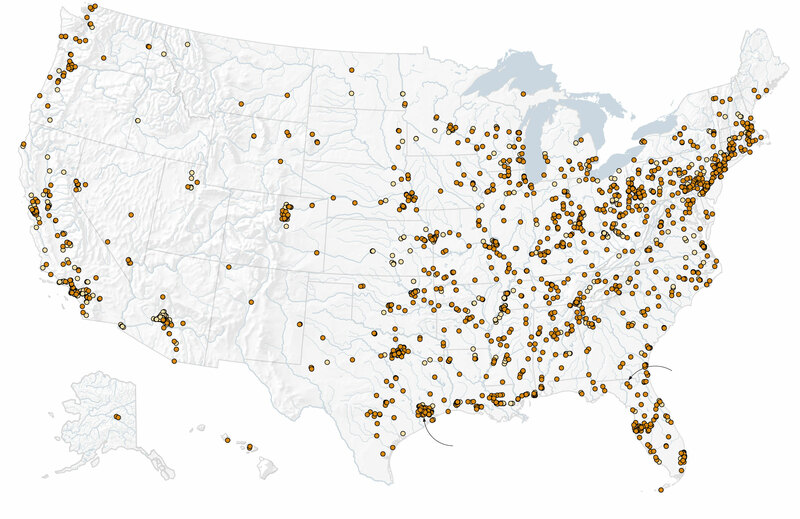 Over 2,500 sites that handle toxic substances are in flood-prone areas, with 1,400 of these sites located in areas at high risk of flooding. As Huricane Harvey showed in Houston, flooding in locations with a high density of toxic chemicals is dangerous for the people situated in that environment. The locations of these facilities is concerning because the federal government does not require facilities located in flood plains to take extra precautions to protect the local communities, and very few state or local governments provide such protections. The lack of safeguards to prevent chemical substance contamination due to flooding can have a serious impact on local communities, with communities of color and low-income communities primarily bearing the burden of adverse health impacts. Many chemicals that escape facilities handling toxic substances during flooding are flammable, presenting a serious immediate risk of fire to the surrounding community. Additionally, many chemicals in these facilities, like barium, mercury, and arsenic, present long-term health concerns for communities exposed to high levels of these substances. In order to provide greater protection for communities surrounding facilities handling chemical substances, in addition to protecting the long-term health of the environment these communities inhabit, we must call on action from all levels of government to require precautionary mechanisms to limit flood risks.